Doran APS8000XL includes a 20" tall column & four different base sizes: 15" x 15", 18" x 18", 18" x 24", or 24" x 24". The internal rechargeable battery and charger provides a simple-to-maintain scale that can fully charge the battery in five hours, even while the scale is being used. The Model APS8000XL Series includes a 20"-tall column, but if additional height is needed, a 30"-tall column is available. Choose from four different base sizes: 15" x 15", 18" x 18", 18" x 24", or 24" x 24". 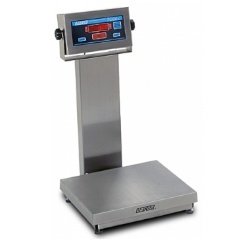 Superior washdown protection has been engineered into the Model APS8000XL Battery Powered Bench Scale. From the heavy gauge stainless steel to the innovative gasket design, this scale meets the NEMA4X and IP69K classifications for washdown protection.